This is my first time over at TMS. I found the sketch a bit tricky but fun. With it being New Year their theme is new beginnings, can be new home etc or something you have that is new. 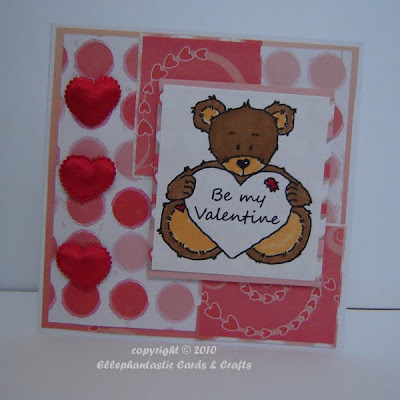 So I've used my digi Roger Be My Valentine which I made yesterday so is very new! I am also new to PTW challenge!! I noticed Lora had entered this when I was blog hopping this morning so I thought I'd enter Roger into this challenge too! This is also a new challenge blog to me. I found the sketch a bit tricky too! You did a great job! That little bear is adorable and the hearts are perfect! Super cute Valentines card. I love those hearts! Aww this is so cute. That is one cute, little bear! Those puffy hearts are a great embellie!